Claudio Ranieri is a happy man, his side hold on as Leicester move up to fourth in the table. Brave defending from Wes Morgan to head a ball away. OOOOOOHHHHH!! Nathan Redmond nearly equalises. His shot his heading into the net, but Danny Drinkwater sticks out his backside to divert the ball wide of goal. Everyone though that was in. More Norwich pressure but Leicester holding firm. Leicester break forward as Danny Drinkwater finds Jamie Vardy in the box, whose effort is saved by John Ruddy. Jamie Vardy is like a toy with one of those long-lasting batteries inside him, battered and bruised but still chasing the ball. Sebastien Bassong heads over Wes Hoolahan's cross. A pressure relieving miss for Leicester. Still four minutes to play. Nathan Redmond's tantalising cross is headed away by Robert Huth. SIX MINUTES of added time. Plenty of time for Norwich to get the leveller. Into the last minute, and Jamie Vardy is still causing problems, dragging a shot wide of goal. Robert Huth heads over for Leicester. Can they hold on? Nathan Redmond's rising drive comes off the angle of post and bar. What's this lad made of?? Marc Albrighton hooks a ball to the stricken Jamie Vardy, who weaves inside a Norwich defender before dragging a shot wide. Vardy showing the toughness of a rugby league player! Norwich win a corner, their 13th of the match. Can they make it count? Jamie Vardy limps back on. He's not going to chase too many more balls on this evidence. Norwich substitute Diermerci Mbokani (right) has made more touches in the box than Cameron Jerome (left) since coming on, adding to the host's goal-threat. It looks like Jamie Vardy twisted his knee while landing there. The Leicester fans looks concerned and so they should. It seems like a nasty one. He's playing with broken bones in his hand and now his leg needs taping up. Leicester striker Jamie Vardy still working hard, but tumbles to the ground while chasing a long ball. He looks in big trouble. They have no subs left. Last throw of the dice from Alex Neil. On comes Northern Ireland international Kyle Lafferty, off goes Cameron Jerome who looks shattered. Face covered in sweat. Someone get him a towel. That's Jeffrey Schlupp's last act of the match. He comes off and Andy King comes on. Leonardo Ulloa and Jamie Vardy try to link up front, but can't quite get on the wavelength. Jeffrey Schlupp drags a shot wide of goal. All Norwich now, and even the home crowd have found their voices. "Ruddy was in no man's land when he came out to get the ball, I think Norwich are lucky that goal was disallowed and get the free-kick." Leicester looked comfortable at 2-0 up, but are now on the ropes. Can Norwich capitalise and bag an equaliser? 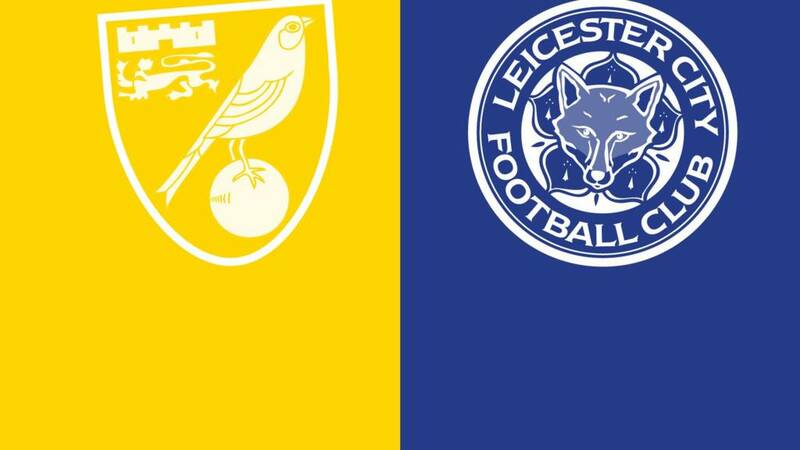 Leonardo Ulloa heads in, but the goal is disallowed for his push on Cameron Jerome. Great decision from referee Mark Clattenburg. This game has come alive. Claudio Ranieri reponds by taking off striker Shinji Okazaki and bringing on Leonardo Ulloa. The home side have been excellent since the second goal and get their reward. Substitute Dieumerci Mbokani has been the difference and he is on hand at the back post to finish Jonny Howson's inswinging cross. Nathan Redmond with some smart work to win the ball back before clipping a cross into the box towards Dieumerci Mbokani, whose powerful header comes back off the crossbar. Another corner for Norwich, which is whipped in by Robbie Brady, but Danny Drinkwater heads away. Two Manchester United men combining for opposing sides. Leicester defender Danny Simpson goes off, while Yohan Benalouane comes on. Robert Huth goes in the book for bringing down a Norwich man. Leicester have a lovely mix of players in their side. Hardworking up front, tough in central defence with speedy wingers. They're on the back foot now, but Norwich are not clinical up top. Dieumerci Mbokani is involved straight away, connecting with a corner and but his header hits Wes Morgan on the head. Appeals for a penalty for handball, but it wasn't. Norwich fans begging for something to go in their favour. Another Norwich change. Matt Jarvis goes off and towering striker Diermerci Mbokani comes on. Norwich have responded well to letting in the second goal, but can they get on the scoresheet? Not yet, as the Leicester defence are working hard to repel the Norwich attack. Then they have Kasper Schmeichel to get past. Let's have a quick look at that second goal. It was a great break from Leicester. Jeffrey Schlupp adding the coolness at just the right time. Leicester owner Vichai Raksriaksorn looks on sternly from the stands, but he'll be delighted inside. His side have started this season in super fashion and are currently holding a Champions League spot. Norwich cranking it up now. Matt Jarvis's inswinging cross is towards striker Cameron Jerome, who looks like he is held down, but nothing given from ref Mark Clattenburg. Alex Neil mixing it up now. Defensive-minded Graham Dorrans goes off, attacking Nathan Redmond comes on. Can he make the difference? He did against West Ham last week. Clear difference in approach by the two teams in the first half if the average positions are anything to go by. Norwich preferring width (shown on left), Leicester opting to be compact and it seems to be working for them. They thought were going to bag at one end, but end up conceding at the other. Leicester win the ball back and break forward. N'Golo Kante feeds a nice throughball to Jeffrey Schlupp, who takes his time inside the area before drilling a low finish under John Ruddy. Norwich nearly got their help!! A cross into the box is headed towards his own goal by defender Christian Fuchs, but thankfully for Leicester, it lands on the top of the net. Almost the dream second half start for the home side. Team are back out. Sebastien Bassong in deep prayer. Norwich need help from somewhere. Back under way at Carrow Road. Norwich really need some inspiration to get back into this contest. They've dominated possession but are behind on the scoreboard. To the Canaries' supporters: "WHERE ARE YOU?? LET'S BE HAVING YOU!" It might not seem like it but the outcome of this match does pale into insignificance in comparison with other issues. With that in mind, Norwich are donating £1 from every match ticket sold to the Child Refugee Crisis Appeal, will hold a crowd collection and, furthermore, will hand over £1 from the sale of selected merchandise. Whatever is raised will be matched by club sponsors Aviva, up to a maximum of £10,000. Leicester lead thanks to Jamie Vardy's penalty. Carrow Road very, very quiet. Get Delia on the pitch at half time with a microphone, please. They need it! Shinji Okazaki with a low, drilled shot across the face of goal but it dribbles wide. A right little livewire, he is, along with Jamie Vardy. The home faithful at Carrow Road are very quiet. That's because their team haven't given them much to shout about. Will Alex Neil shake it up at half time? He needs to do something to give his side more potency in the final third. Further excellent work from Jamie Vardy, who chases again before putting a dangerous cross into the box which Alex Tettey clears. A long punt up field sees the ball bounce in the Norwich penalty area, which John Ruddy comes to meet after initially hesitating. Shinji Okazaki gets to it first and heads the ball on, before being taken out by Ruddy, but Mark Clattenburg only points for a goal kick. Could easily have been a second penalty. Norwich's left flank of Robbie Brady, Matt Jarvis and Wes Hoolahan have been feted in games this term, but it is down the right with Steven Whittaker and Jonny Howson that the hosts are funneling many of their attacks. Robert Huth heads away a dangerous cross into the box from under his own crossbar. That was going into the top corner, but alert defending from the German. Norwich continue their patient style of play, happy to pass the ball around and work an opening. Leicester's defence has too firm so far, with Robert Huth and Wes Morgan looking dominant. The hosts have been utterly impotent in the final third, despite all their pleasing play. Cameron Jerome is isolated and is like a little boy scrapping with the hulking Robert Huth and Wes Morgan. Nathan Redmond strips his tracksuit off and is ready to come on, but Wes Hoolanhan says, 'hold on, I can play on here'. Redmond sits back down again and puts his zipped jacket back on. Got some good up-down exercise done there. Problems for Norwich as main man Wes Hoolahan hits the deck. It looks like a heel injury. Can he continue? It was a clumsy concession by Sebastien Bassong, marking the culmination of a spell in which Norwich looked lax defensively. And scorer Jamie Vardy has now scored in five consecutive games for the first time since arriving at Leicester from non-league Fleetwood in 2012. Leicester on top now, and like a zombie in The Walking Dead, they can smell blood. Can they take complete control of this game and get a second? Marc Albrighton's fizzes ball in the corridor of uncertainty, in between the goalkeeper and defence, but Jeffrey Schlupp can't stretch enough to get a toe on the ball. Think Gazza against Germany at Euro '96. Regarding the penalty, the Norwich fans are not happy but it is really clumsy defending from Sebastien Bassong. Jamie Vardy makes a run across the Norwich defender, who is slow to react and clips the England man. Jamie Vardy steps up and dispatches with confidence. John Ruddy dives to his left, the penalty goes the other way. Leicester have not been in this game, but go in front. That's football. Sebastien Bassong brings down Jamie Vardy and Mark Clattenburg points to the spot!! John Ruddy is looking to get back into the England team and he shows just why. A ball from the left goes right across the box to Danny Drinkwater at the back post, who looks like slotting in but Ruddy with some cat-like reflexes blocks the ball. Great block Russell Martin! Captain setting the example for Norwich. Jeffrey Schlupp with some neat footwork to get into the box, but his low shot is well stopped by Martin. Leicester getting back into this game now, spreading the play from one flank to the other. Marc Albrighton find Shinji Okazaki again, but the Japan international's header is over the bar. Leicester break away for the first time, as N'Golo Kante long ball forward is chased down by the willing Jamie Vardy, who nicks the ball past Steven Whittaker. The England striker attempts a cheeky finish through the legs of John Ruddy at the front post, but the Norwich keeper is wise to it and saves with his legs. ...which Robbie Brady whips in but goalkeeper Kasper Schmeichel with a good punch away. Norwich boss Alex Neil seems a little agitated in his technical area, not sure why. His team are doing well so far, despite not making a breakthrough. They've been on top in this game, but Leicester seem happy to sit back and let them play in front of them. That's comfortable to defend against. Good football from Norwich, knocking the ball around nicely, including towards goalkeeper John Ruddy who passes it out rather than knocking it long. Leicester holding firm at the back though, keeping their shape and not allowing their opponents to slide a ball through. Graham Dorrans screams at team-mate Alex Tettey who gives the ball away in a dangerous area. It looks like the Ghanaian lost his bearings a little after that fall. No damage done though, as Norwich win the ball back. Both teams just sizing each other up so far, not exactly committing men forward at this stage. A couple of chances for each side so far, but still goalless after 10 minutes. In the lead up to that chance, Norwich midfielder Alex Tettey slipped over and landed awkwardly on his shoulder. He receives some treatment but is back on the pitch for now. Shinji Okazaki involved again, pealing away from the attention of Sebastien Bassong, before flicking a header narrowly over the bar. The cross from Marc Albrighton was a little behind him, so the Japanese striker couldn't quite arc his body enough to head the ball down. Don't see the 4-4-2 too much these days, but Leicester have two strikers up front who are very hardworking. Both Jamie Vardy and Shinji Okazaki work their socks off for the 90 minutes and they are doing just that so far. Norwich looking get some control by passing the ball around on the deck. Patient stuff. Interesting midfield for Norwich, with Alexander Tettey and Graham Dorrans sitting, Wes Hoolahan is playing off Cameron Jerome with Jonny Howson and Matt Jarvis on either side. Leicester have gone for a more orthodox 4-4-2. First chance of the game falls to Norwich. It is a beautifully crafted move with Matt Jarvis and Wes Hoolahan both involved with some quick passing on the edge of the area. Striekr Cameron Jerome's run into the box is found by his team-mate, but he lashed the shot over the bar. More composure and that could have been the opener. Leicester striker Jamie Vardy has begun the game in typical dogged fashion, chasing a ball over the top which the Norwich defenders have to deal with. Broken bones in his right hand means he plays this game with a cast on. Last few words of advice given, fist bumps done. We are under way at Carrow Road. "Anything could happen in this one! Norwich are unbeaten in four games in all competitions and have played some lovely football at times this season. "Nathan Redmond is on fire and Wes Hoolahan at last has a manager who fully believes in his creativity. "Leicester were run ragged by Arsenal but their best performances all campaign have come away, where Riyad Mahrez can break with such speed to link up with Jamie Vardy, who is one of the hardest-working players anywhere this season. "If Vardy scores, it'll mark his best ever run in league football. His contest with the in-form Russell Martin could decide the outcome." Riyad Mahrez is sat on the bench and does not look amused. Who can blame him after his spectacular start to the season. Is it a wise move from boss Claudio Ranieri, or will it back fire? Spare a thought for everyone who selected the Algerian in their Fantasy Football teams. RIP points for this week. Carrow Road is filling up as we approach kick-off and despite being early October, the sun is still shining in East Anglia. Norwich's bright yellow and green shirts are perfect for this weather, but will the sun still be shining on them at full time? Norwich have won one of their three Premier League games at Carrow Road since promotion - beating Bournemouth 3-1 in their most recent league outing here. Leicester, meanwhile, are unbeaten away from home in the top flight this term, winning at West Ham and drawing with both Bournemouth and Stoke. Mark Lawrenson thinks this match will end in a 2-1 Norwich win. "I think they will tear into the Foxes, and I fancy them to beat them," reckons our football expert. Take on Lawro - and football fans from across the world - by having your say in all of this weekend's fixtures in our football predictor game. Plenty murmurs of surprise at Carrow Road when the team sheets arrived and it became apparent that Riyad Mahrez had been left on the bench by Leicester manager Claudio Ranieri. There have been no suggestions of an injury, which makes leaving out their most influential performer in the opening weeks a bold call. Norwich make one change to the side that drew against West Ham last week, as Matt Jarvis returns to the starting line-up in place of Martin Olsson. The big news for Leicester is that star man Riyad Mahrez misses out. Jeffrey Schlupp comes in, while Danny Simpson also gets a start at right-back in place of Richie De Laet. Not long ago, these two sides each spent a season in the third tier of English football, wondering if they'll ever get back to the big time. Fast forward a couple of years and not only are they there, Norwich and Leicester harbour bigger ambitions than just preserving their status in the Premier League.